Another Beautiful Day in Paradise. We had a slight breeze out of the E-SE. It appeared it would be a little tough against the wind coming back from Honeymoon Island so we headed North. New skater Richard B and bicyclist Jackson Y joined us. Absentees Vivian, Jeanine and Roy came. Welcome all. A couple of skaters made it to Tarpon Springs and around the town a bit. Dee thinks they must have done about 16 miles. 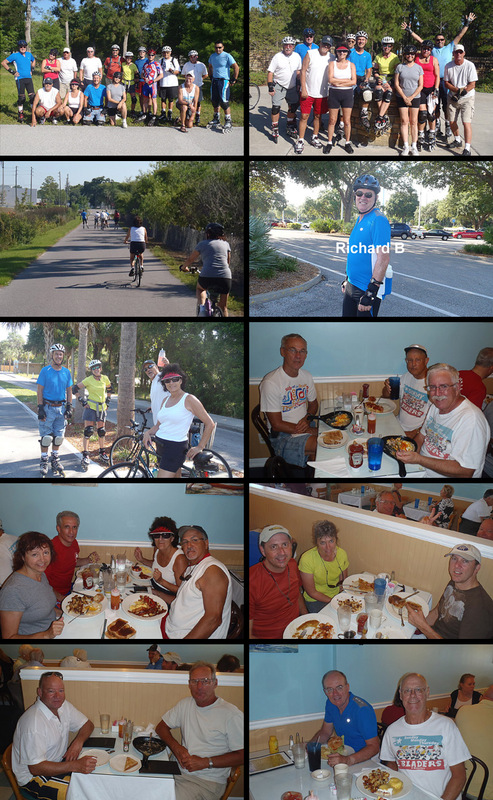 Dee's group made it to Tarpon Ave and they did 15 miles. Others turned around as they desired. On some parts of the Trail the breeze was blowing against you on the way back which didn't help as the temperature was pushing the high 80's. We had 6 bicyclists. Our group picture was just South of the overpass. Got a picture at Wall Springs and a couple on the Trail and one in Tarpon Springs. We Brunched at Benedict's as planned. They were going to set up a big table for us but we elected to sit at 5 regular tables as service is usually better at small tables. Service was about the same for some as the last table got finished and out in a little over an hour. Our Brunch judge, Rob H, was absent so we had to wing the rating. We arrived at a rating of 9.4.